Dill is like a breath of spring in the midst of our winter. and since it has long been known as a soothing, sedative herb, perhaps dill is just what we need in Utah now. A native to the Mediterranean regions as well as southern Russia, Dill is now cultivated throughout the world. Five thousand years ago, dill was listed in the Egyptian list of herbs. Medicinal use prevailed until the fifteenth century when it gained culinary popularity as well as becoming a powerful charm against witchcraft and evil. Today the culinary uses are so many it would seem it could be used in most every recipe, and the beauty of the rich green feathery leaves makes dill a lovely garnish. Since over-cooking will destroy the flavor, remember to add the dill just before serving. Dill with new potatoes, green beans or asparagus is a sure sign of spring, but for now lets try some in green salads, potato salad, or coleslaw. 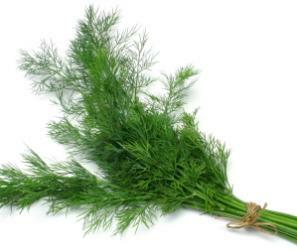 Dill is a must for most fish dishes, baked, poached, broiled, or however you cook it, there is a sauce made with dill to add. An interesting condiment for lamb or fish combines dill with shredded daikon and minced onion bound with a small amount of plain yogurt or sour cream. To marinate your chicken, try plain yogurt and lots of fresh dill. before serving. Good with lobster. And so on and on with the uses of dill. The Scandinavian countries, where dill grows wild, offer the Swedish “dillybread“, or the buttermilk soup of Finland, or the lovely Denmark made open-faced sandwiches garnished with fresh dill. Cheese balls rolled in dill plus other herbs make for a different taste as well as being pretty. Get your imagination going and try the taste of fresh dill to brighten your winter menus.